Wrinkles, redness, dryness, and fuzz. 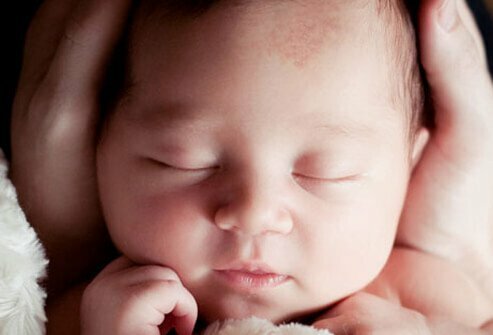 Newborn skin is far from flawless but it usually doesn't mean something is wrong. Baby's skin is adjusting to life outside the womb. Most skin imperfections disappear over time. For example, premature babies sometimes have soft hair on their face and back. Late babies often have dry, peeling skin. Both should go away within a few weeks. You likely don't need lotions or creams during baby's first month. When you do begin using skin care products, be sure to use only baby products. Baby skin is sensitive. Products formulated for adults may have dyes, fragrances, and cleansers that are too harsh for infant skin. In general, avoid using baby powders -- talc may cause lung problems, while cornstarch may aggravate a yeast diaper rash. Immature blood vessels may cause small red patches called stork bites. They can be on the face or back of the neck. Crying may make them brighter but they usually disappear within a year. Birth can cause other small scratches or blood spots on your newborn that should heal in a couple of weeks. Other types of birthmarks may stay around longer or never go away. If you're concerned, talk to your pediatrician. It's OK to Skip a Bath? Babies don't need a daily bath. During the first few weeks, keeping baby clean during dirty diaper changes and doing sponge baths should do the trick. No full bath is needed until baby's about a month old. If they are younger than 1, they can be bathed just every 2-3 days. Bathing too often can dry the skin. Between baths keep baby's face and hands clean by wiping with a damp, warm washcloth or cotton balls. Until baby's cord falls off, avoid getting it wet. If it gets dirty, clean with a baby wipe or rubbing alcohol. Instead of full baths, try sponge baths. Gather a basin of warm water and clean washcloth so you can keep one hand on the baby at all times. Lay a soft towel on a clear, stable surface for baby to lie on. Keep him warm by leaving him wrapped in a towel, only uncovering the part of baby you're washing. When the cord does fall off, there may be slight oozing of blood. Don't worry about this -- just keep the area clean with soap and water. Talk to your doctor if you see pus or redness of the skin around the stump area. When baby's ready for full baths -- remember, his skin is soft and sensitive. You only need to fill the basin with 3-4 inches of water. Test water on the inside of your wrist to be sure it isn't too hot. Keep baby's skin hydrated by bathing in warm water for only three to five minutes. If using lotion, apply while baby is still wet, then pat dry instead of rubbing. Once she's ready for baths and if she has hair, she’ll only need a shampoo once or twice a week. It's OK to gently wash her soft spots. Use a baby cleanser or baby shampoo. To avoid getting it in her eyes, cup your hand at her forehead to shield her face when rinsing. Or tilt her back a little so the water runs down her backside. Wet and dirty diapers can irritate infant skin, causing diaper rash. Red and bumpy, it usually clears in a week. To help prevent diaper rash, check and change baby's diaper frequently. When changing a messy diaper, gently wipe baby clean and pat dry. Wipe girls front to back to avoid infections. If baby does get diaper rash, diaper cream can help. Also try letting baby go diaper-less for a bit to air out skin. Babies get rashes. But call the doctor about a rash when there is itching, blisters form, skin is oozing or crusting, red or purplish dots appear all over, or baby has a fever. Eczema is the most common cause of itchy rashes in babies. But babies can also get contagious skin diseases. 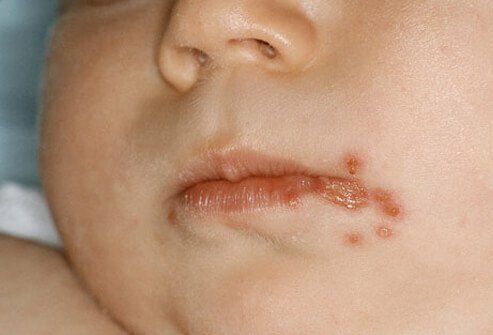 These may include: chickenpox; measles; hand, foot and mouth virus; herpes simplex (as seen here); scabies; and impetigo. Avoiding skin rashes will keep your baby smiling and happy: Use a gentle detergent to wash everything that touches your infant's skin, from bedding and blankets, to towels and even your own clothes. You'll cut down on the likelihood of baby developing irritated or itchy skin. Lucile Packard Children's Hospital at Stanford: "Bathing and Skin Care," "Newborn Appearance." American Academy of Pediatrics: "Bathing Your Newborn." 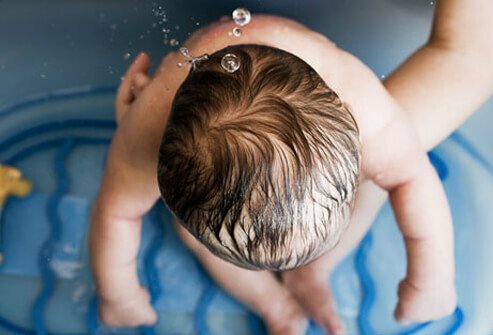 DrGreene.com: "Guidelines for Bathing Your Newborn." The American Academy of Pediatrics: Caring for Your Baby and Young Child. Bantam Books, June 1998. March of Dimes: "Giving Your Baby a Bath." Nemours Foundation. 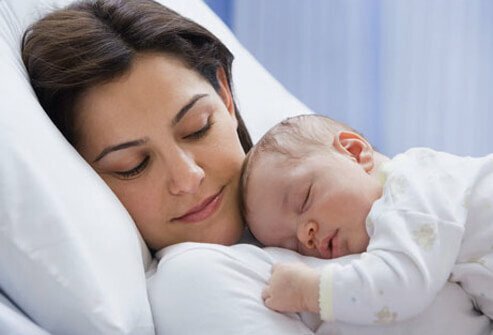 KidsHealth.org: "Looking at Your Newborn: What’s Normal," "A Guide for First-Time Parents." "The skin." Darmstadt, G. and Sidbury, R. Nelson Textbook of Pediatrics, 17th edition. Behrman, R., Kliegman, R., and Jenson, H. (eds. ), Saunders, 2004.